If you're looking for a way to enjoy the beautiful park system in Minneapolis, check out Kairos Dance Theatre's performance at the Lake Harriett Bandshell on Thu, Jun 24. This intergenerational dance company is doing highlights from their Ida & Irv show from this spring. 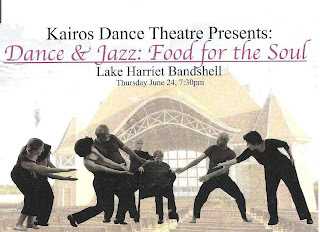 I attended their performance on Mon night at Loring Park and can tell you there will be jazz, storytelling and smiles -- perfect reasons to plan a picnic in the park!